The energy industry in Australia is rapidly evolving. 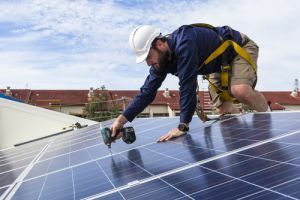 While we’ve traditionally relied on large fossil fuel generators to meet our electricity needs, solar, storage and other renewable technologies are helping households take power back into their own hands. Hundreds of thousands of Victorians are already reaping the benefits of solar, and trimming their power bills. With solar panel prices still coming down and a host of government rebates to help get you started, it’s worth considering if now’s the right time to buy or upgrade. In this article, Canstar Blue will walk you through everything that Victorians need to know about solar. We look at installation prices, rebates, feed-in tariffs, buying tips and more. How much do solar panels cost in Victoria? Victorians should expect to pay between $3,600 and $8,000 for a standard solar system, depending on the size of the system. While a small system (3kW and under) should usually cost no more than $4,500, systems that are 10kW or larger can cost in excess of $13,000. The following table shows typical solar installation costs in Victoria compared to the national average. Keep in mind that these prices do not account for certain state solar rebates (discussed below). This means solar may cost far less than you might expect. How many households have solar in Victoria? There are approximately 375,000 Victorian households with solar, which accounts for approximately 15% of the state, according to the Clean Energy Regulator. In 2018, the government announced the ‘Solar Homes Scheme’, which aims to further encourage the uptake of solar with an upfront rebate. The government intends to increase the number of households with solar to 650,000, taking the total number to one million. If you don’t already have solar, now’s the time to get on board. 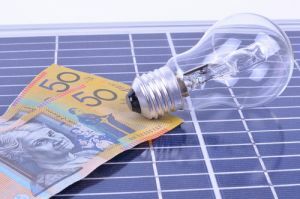 Victorians currently benefit from some of Australia’s most generous solar incentive schemes. These include Small-scale Technology Certificates (STCs), Feed-in Tariffs (FiTs), and the already mentioned Solar Homes Scheme. Small-scale Technology Certificates (STCs) operate as a form of rebate on the initial purchase price of a solar system. When a customer installs a renewable generator, be it wind, hydro or solar, customers will receive a number of certificates. The STCs can be exchanged for about $40, and can save you hundreds or even thousands on your solar system. The number of STCs that you receive depends on the expected electricity output of your solar system over the course of its life. Households generally receive more STCs if they live in a sunny area or install a larger system. Those in Zone 1 (see diagram) receive the most certificates for installing solar, while customers in Zone 4 receive less. As you can see, the majority of Victoria – including Melbourne – is situated in Zone 4. Households that install a solar system or solar hot water between 19 August 2018 and 30 June 2019 can apply to receive a 50 per cent rebate on solar, to the maximum value of $2,225. To be eligible, households must have a total annual income under $180,000, and be the owner-occupier of the property installing solar. The home must be valued at under $3 million and the property must not already have a solar system installed, meaning the rebate won’t apply if you’re just looking to upgrade an existing system. For more information and to apply, visit Solar Victoria. When your solar panels produce electricity and no one is home to use it, the excess power flows on to the shared electricity network – commonly known as ‘the grid’. In exchange for the electricity, solar customers receive a small rebate known as a ‘feed-in tariff’ (FiT) for each kWh of power exported. There are two types of feed-in tariff available in Victoria – a ‘single rate’ tariff and a ‘time-varying’ tariff. As the names suggest, the single rate feed-in tariff applies one rate for all electricity produced, while the time-varying FiT applies different rates at different times of the day. Customers earn the highest FiT at peak times from 3pm to 9pm weekdays, while lower off-peak rates apply every day from 10pm to 7am. All other times are considered the ‘shoulder period’ and a moderate rate is applied. The minimum single rate feed-in tariff under Victorian law is currently set to 9.9c/kWh. The minimum time-varying rates are 7.1c/kWh for off-peak, 10.3c/kWh for shoulder, and 29c/kWh for peak. The Victorian electricity market is incredibly competitive, and while the state has minimum feed-in tariffs, many retailers will offer more than that to win your custom. It’s important to shop around for a competitive feed-in tariff, but also don’t forget to consider other important things like electricity usage rates, discounts and contract terms. A good FiT for your solar power might not necessarily mean a good deal if you’re paying too much for electricity. The table displays residential single-rate feed-in tariffs offered by each listed retailer. Source: Canstar Blue electricity database/respective retailer websites, March 2019. Batteries allow homes to store excess power generated by their solar panels, rather than feeding into the grid. The electricity stored in the battery can be used later on – even at night or through a blackout. Since a typical feed-in tariff is much lower (9-20c/kWh) than the rate you would pay for electricity usage (typically 25c/kWh or more), households can save even more by storing their solar to use for themselves later on, rather than sending it to the grid. Unfortunately, solar batteries don’t come cheap. While you can find smaller modular units for around $2,000, larger batteries can set you back between $8,000 and $12,000. In some cases, the savings generated from a battery could justify the cost in the long run. Typically it will take between 10 to 15 years for a battery to pay for itself, though keep in mind that some batteries aren’t warranted to last that long. A solar battery is most likely to return dividends for homes that use a lot of electricity, or are charged high electricity usage rates. It will also be useful if you live rurally and grid connections are expensive, or your network has imposed export limits. Whether or not a solar battery is a sound investment is entirely dependent on your circumstance. While solar is undoubtedly expensive, the savings you make on electricity can often cover the cost of the system after several years. 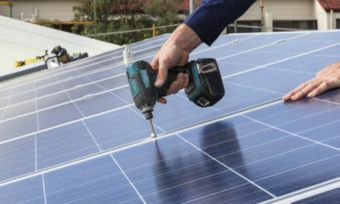 The current rebates and incentives – particularly the Victorian Solar Homes Rebate – help to make solar a lot more affordable, meaning now is probably as good of time as any to on board with solar. With that said, solar won’t be the right choice for some – especially those households that receive little sunlight through the year and/or are already receiving a reasonable deal on their electricity. 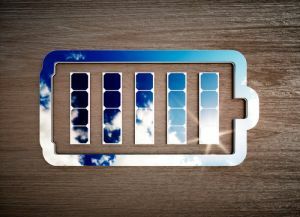 As prices for solar panels and batteries continue to fall however, solar may still be a wise investment down the road. The viability of solar for your home depends on a myriad of factors. Before you get a quote, here’s a few key things to ask yourself. Is your roof appropriate for solar? How sunny is your roof? Solar works best when the roof is unshaded and your suburb receives plenty of sunshine year-round. Where should you install on your roof? Solar panels should ideally face north to receive the maximum sunlight. If you don’t have a north-facing roof, or your roof is flat, then an installer may be able to install mounts that help angle the panels correctly. How old is your roof? If you live in an old property, then ask your installer if they think the roof is appropriate for solar panels. In some cases, minor works may be needed on old properties to ensure the system is safe. Larger solar systems produce more electricity and save you more on power, however they’re also more expensive. This is a balancing act between initial cost and future savings. If you’re looking for a system that can cover all or most of your electricity consumption, then you will need a 5kW system at least. If you’re just looking for a bit of bill relief, then it’s fairly standard to opt for a 3kW or 4kW system. If you’re planning on leasing or selling your property, it’s important to understand that you usually won’t be able to take your solar system with you when you leave. Solar panels increase the value of a property however, and Realesate.com.au also found that renters are likely to pay more rent for a property with solar. That means solar could be a great property investment. *Costs based on annual usage calculations using statistics from AER for a three person household on the Citipower electricity network in Melbourne, April 2019. For more information on annual cost calculations please click here.